Now that's what I call a fan. And a rotor. You are at:Home»Marine Corps»Now that's what I call a fan. And a rotor. Marine Corps Staff Sgt. 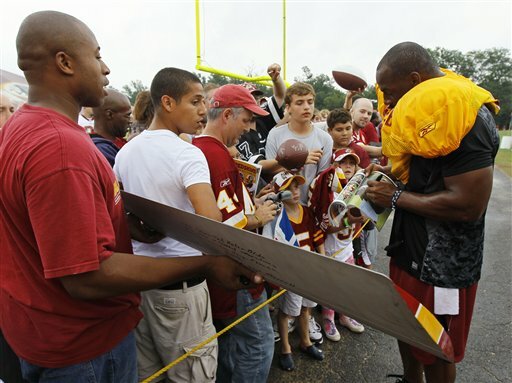 Reggie Lownde holds a Cobra helicopter tail rotor, painted in Washington Redskins colors, for Redskins quarterback Donovan McNabb to sign Wednesday after the team’s training camp practice at Redskins Park in Ashburn, Va. Lownde is stationed at Camp Lejeune, N.C.
There’s picture of the front of the blade here. According to TBD.com, Lownde asked to keep the rotor from an AH-1 after it was destined for the scrap yard in Iraq. A fellow Marine painted in Redskins colors, and this week he made the trip to Redskins camp to get it autographed.